Welcome back for another Travel Tuesday post inspired by Megan of Semi-Charmed Kind of Life. This week, she asked What is one item you absolutely cannot travel without? As many of you know, we are major Road Trippers in this family. I've shared my "Eating on the Road" tips before and now I want to share another little gem we have learned through the years. It's called The Road Trip Bag. When traveling with kids, especially on loooooong trips, the car can become a hectic place. We try to give the boys their own little travel bags filled with goodies to keep them busy. However, we usually don't make it to mile marker one before that bag is dumped onto the floor. If not organized properly, the car can begin to resemble an episode of Hoarders. And there are just some things that need to be handy and ready to grab at all times. Therefore, we always keep one bag full of essential, grab-when-needed items. 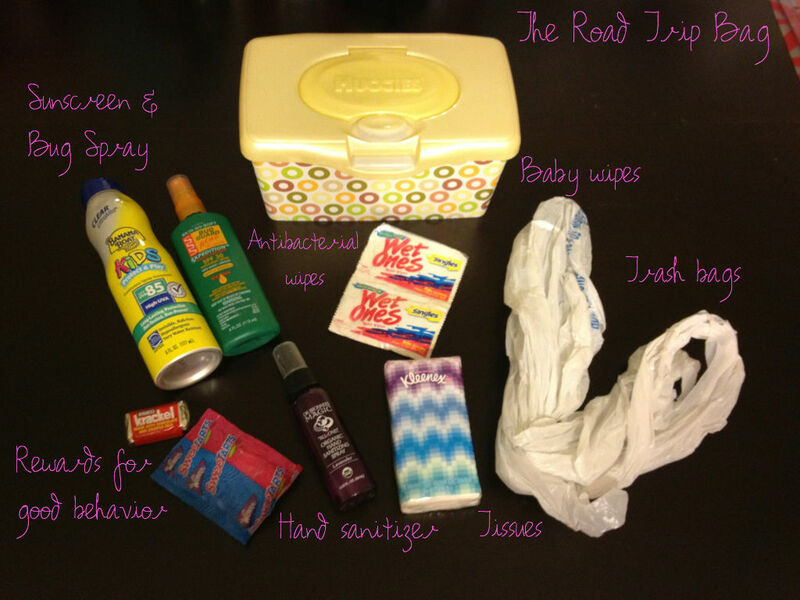 And here's what we keep in our Road Trip bag. 4. Trash bags: you never know how handy these are until you don't have one. 5. Tissues: take these into the bathroom with you, just in case. 6. Hand sanitizer: nuff said. 7. Rewards: Let's call this what it really is. Good ol' fashion bribery. The Road Trip bag is really just a great bag to keep in the car at all times. I hope you consider it on your next cross-country adventure. And be sure to check out Megan's site for more Travel Tuesday posts! I bribe my students I know for a fact I'd bribe my kids!